Join us Friday nights for a glass of wine during Late Night. Hungry? We welcome food. Stop by your favorite Avila Farmer’s Market booth and pick up dinner to bring in and enjoy with your glass of Peloton Cellars wine. Every Friday April 5-September 27, 2019! Come sip wine and learn how to make a beautiful charcuterie board! In this class, Christiana will teach you to the basics of how to assemble a perfect charcuterie board for any event. You will go home with your own board that you create in this class as well as a bottle of Peloton Cellars Albariño. Join us for this fun event at Peloton Cellars tasting room! Join us April 13 from 6:00-8:30 for BINGO. Wines will be served by the glass. Bring your dinner or order a pizza. It’s a great night and there’s fun to be had by all. A hilarious game that will have you laughing from your belly. The rules are simple. Compete to create the funniest meme by pairing Caption Cards with the Photo Card in play. A rotating judge picks the best combination each round. Prizes will be given for the winner. Peloton Cellars wine will be available by-the-glass or bottle. Hungry? You’re welcome to bring in dinner. Each taster rolls 3 dice three times. Each time a number is rolled the player crosses off that number on their game board. If you roll all the numbers on your game board you have completed the rainbow and the YOU WIN! Prizes include wine discounts, merchandise discounts, or other goodies. On March 17 each taster will roll 4 dice one time. If the sum of any of the dice equals 17, the taster WINS 17% off their entire purchase! Not a Member? That’s okay…these 2 wines are on sale for you too at a 15% savings. Or, join the club and receive more. Visit the Wine Club page on our web site. Also ~ All holiday merchandise is 20% off: candles, wine totes, dish towels, and more! Celebrate with us the culmination of the 2018 harvest season at our 10th annual Winemaker's Dinner with owners Bill Kesselring, Kjell Akerstrom, Tim Kesselring and Jeff Brown on October 13, 2018. Owner/winemaker, Bill Kesselring, has hand chosen premium wines from our library for this special night. Farm to fork artisanal dishes have been created by local chef/owner of Phresh, Tara Stumph, and live music to entertain will be performed by San Luis Obispo's top musician, Doug Groshart. Hear from Bill and his wife/GM, Trish, speak on the current harvest and how it compares to years past, future wine releases and recently awarded wines will also be announced. It's our favorite night of the year and we want to celebrate it with you! To purchase tickets contact the tasting room, 805-627-1080, email trish@pelotoncellars.com or visit the 'Buy Event Tickets' tab on our website. This is a fix menu. We apologize but food substitutions cannot be made. Refunds cannot be made after September 28! Grab friends or your love ones! Wine is available by-the-glass and your sure to have loads of fun. Feel free to bring food or order a pizza! Early Bird pricing and vacation packages available. Take advantage and get your tickets early. Please stop by the tasting room to taste through the new releases and pick up your wine club. Light nibbles will be provided. Please RSVP to trish@pelotoncellars.com or call the tasting room at 805-627-1080.
Who doesn't love a little friendly competition? Well, we do! Join us the 2nd Saturday of every month for Game Night. We will mix it up with dice games, card games, board games, app games, etc. This event is open to anyone 21 years of age and older. Wine will be available by-the-glass or bottle. SLO Wine Country celebrates the harvest on November 3-5, 2017. Join me on the roof top of the Sea Crest Resort in Pismo Beach for complimentary wine tasting and by-the-glass or bottle purchases. Take in the breathtaking panoramic view of Pismo Beach and treat yourself to an evening of relaxation with ocean breezes and the simple sounds of local musicians. Crisp and refreshing with moderate acidity. Lemon zest, white peach, hint of honey and green apple. All CASE orders will receive free shipping until July 21, 2017! A memorable night you won't want to miss. Join us and be a part of the memory of our inaugural wine and sushi pairing dinner at Kanpai Sushi on May 15. 'Spring Butterflies' & Bring an Unfinished Piece. What better way is there than to start your beautiful Spring morning at the beach painting and sipping on a Peloton Cellars wine spritzer? This class is designed for all ability levels and those who have attended one of our classes before and would like to finish their piece. Cost is $45 (Spring Butterflies), $30 for those finishing their piece. This includes a wine spritzer, instruction and all supplies. Must be 21 or over to have wine. Follow the link below image to reserve your seat. Join us at Peloton Cellars on Tuesday January 10 at 5.30 pm for another fun painting and sip event. Tara Jalalian will show you how to create a beautiful painting while you are having fun and enjoying a glass of wine! For painters of all levels, beginner to advanced. Cost: $40 includes painting instructions, art supplies, and a glass of wine. For ticket purchases click here or call 805-627-1080. We are looking forward to a fabulous night where our local chef will create the magic between food and wine pairing perfection. Singer/Songwriter, Doug Groshart, will be with us once again as well to set the perfect ambiance and keep the fun rollin throughout the evening. For tickets click here or call 805-627-1080. $120 for members/$150 non-members. Traditionally, the day prior to our annual Winemakers dinner we organize a group ride and 'Happy Hour' at the tasting room. This year we've decided to hit the trails of SLO county's mountains for some epic mountain bike riding. Cold local craft beer and sandwiches await those who conquer the ride on September 30, 2016. Trail location and time coming soon! Join us at Peloton Cellars on September 21 at 6 pm for another fun painting and sip event. Tara Jalalian will show you how to create a beautiful painting while you are having fun and enjoying a glass of wine! The Central Coast Classique is a 30, 64, and 100 mile bike ride that tours through the most beautiful and scenic parts of San Luis Obispo County. Ride along the coast with oceanside views, through vineyards, farmscapes, and lakeside scenes. At each fully stocked rest stop, participants are able to punch their tasting cards for amazing free tastings and discounts at local wineries in Edna and Avila Valley. Art Bar - Paint and Sip! Join us at Peloton Cellars on August 10 at 6 pm for another fun painting and sip event. Tara Jalalian will show you how to create a beautiful painting while you are having fun and enjoying a glass of wine! Why: Because we appreciate you! 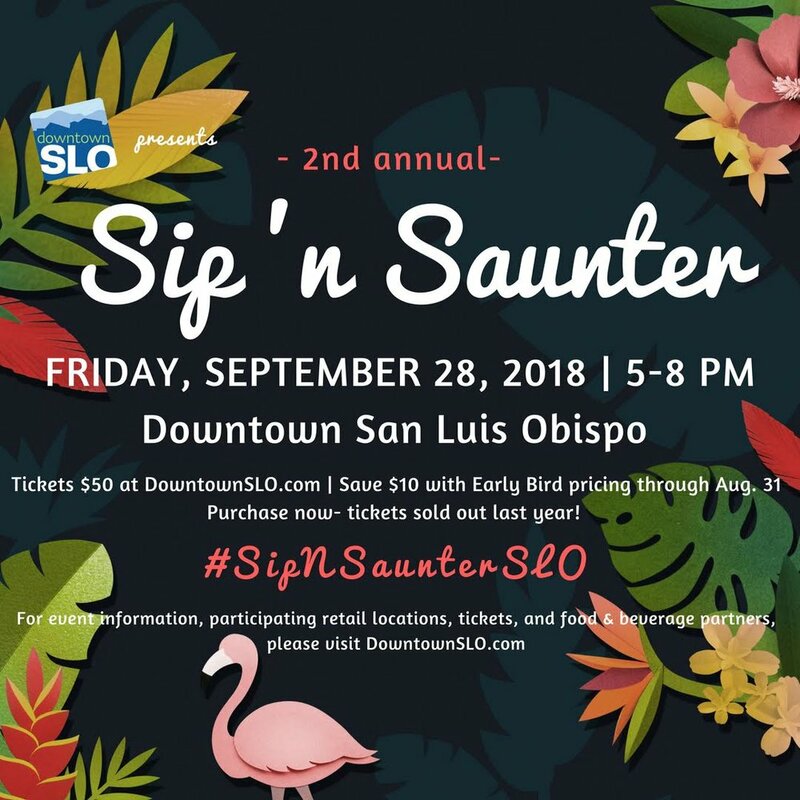 This night is just for you, SLO Locals and Wine Club Members! We will feature a Library Wine every Thursday night and offer 1/2 off Wine by-the-glass from 4:30-6:00pm. We will see you there! Join us at Peloton Cellars on July 14 at 6 pm for a painting and sip event. Tara Jalalian will show you how to create a beautiful painting while you are having fun and enjoying a glass of wine! For the first time ever we are opening our library doors, dusting off our beautifully aged wines and featuring them in our fan favorite Gourmet Grilled Cheese and Wine Pairing Event! Join us anytime between 1:00-5:00 for a trio of library selection wines and artistically created gourmet grilled cheeses created by local chef, Tara Stumph. These library wines will be available for purchase by event attendees only. $45 (Wine Club members call 805-627-1080 for a discount code). Click here to be taken to the ROTB event ticket purchase (click the green Get Tickets button to select the event). A beautiful event held at the Chapman Estate in Shell Beach. Information and how to purchase tickets to come soon. Wine Club members with last names beginning with N-Z, please join us this evening at the tasting room to taste through our new releases and pick up your new wines.